Kiwis are one of the fruits not everyone knows about, or has even tried. But for those who do, you know they taste great. 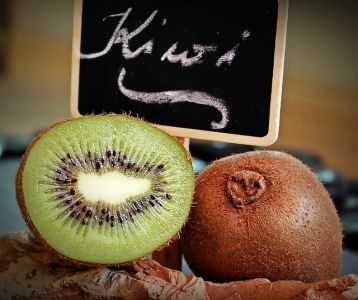 Our question is, are kiwis good for you? Yes, they’re fruits. And fruits are generally considered healthy. But one thing we’ve learned is that not all fruits are created equal. In fact, some are super nutritious, whereas others aren’t as “gifted”. That said, where does the kiwi fruit stand? And more importantly, are they healthy? In this section we go into detail on whether or not this small furry fruit is healthy. It’s exotic and has a great taste. But should you be eating it? 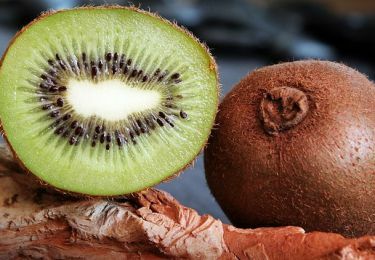 They’re small, but kiwi fruits are very nutrient dense foods. This exotic fruit is approximately 3 inches long and weighs about four ounces. That isn’t much when it comes to size. Especially when compared to other fruits like bananas, watermelons or cantaloupes. But while it comes in a small package, it packs a big punch nutrient-wise. Here are some nutrition facts on the kiwi fruit. A kiwi fruit contains only 42 calories. This makes them a low calorie food you can snack on without being afraid of gaining weight. and 6% of our daily RDA for folate. For such a small fruit, you get excellent bang for your buck in terms of vitamins and minerals. 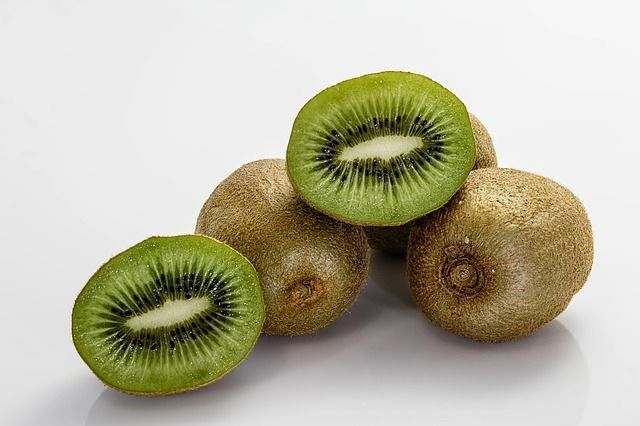 One of the biggest health benefits of the kiwi is vitamin C. With one serving of the fleshy green fruit containing more vitamin C than an orange. Vitamin C as well as other antioxidants can boost the body’s immune system. Vitamin C is an essential nutrient as well. It helps in preventing damage on our skin caused by sun, pollution and smoke. This vitamins also helps the body focus and fight against stress and aging. It can support healing as well as assist in iron absorption and aid in improving bone density. 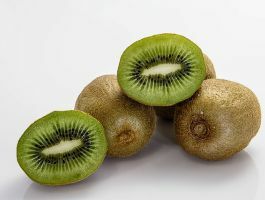 By eating a healthy dose of kiwis each day, you can expect to receive benefits such as radiant healthy skin tone and texture, lower blood pressure, as well as a lower chance of heart disease and stroke. Studies have even suggested that eating kiwis can even help adults sleep better at night! The fuzzy brown coated fruit can improve the length of sleep in adults with self-reported sleep disturbances. Say hello to a brighter smile and clearer skin, oh and forget about those bags under the eyes. Did you know that according to the National Health and Nutrition Examination Survey, less than 2% of US adults meet the daily recommendation for potassium? The level of potassium aids the body in electrolyte balance by counteracting the negative effects of sodium. Thus, it helps in control blood pressure. Raw kiwis contain protein-dissolving enzymes. A study published in Thorax revealed that foods that are rich in potassium also helped improve asthma. The study took place in Northern and Central Italy where researchers followed over 18,000 children ages 6-7 years old. They found that the children who ate a lot of citrus and kiwi fruit experienced 44% less wheezing episodes compared to children consuming citrus less than once a week. This can also translate to health of an individual’s heart. As increased potassium intake along with low sodium is necessary for one to lower the chances of developing heart disease. Other positive factors include reducing sodium, lower chance of stroke, higher muscle mass, managing bone mineral density and a lower in the formation of kidney stones. In addition to the valuable nutrients in kiwis, they can also support weight loss. They’re a great substitute for junk food. And offer you something healthy to snack on in the mid-afternoon. They are low in calories, and contain a good amount of fiber. These enzymes aid the body digest food properly while the fiber helps clean out toxins from the intestines. Fiber-rich foods such as the kiwi are essential for keeping blood sugar levels of diabetic patients under control. The one thing to consider with kiwis is that they do contain a good amount of sugar. Each kiwi fruit has around 8 grams of sugar. While this kind of sugar isn’t as bad as the refined white sugar we add to our coffee, it still affects our blood glucose level. At 8 grams per fruit, it isn’t as high as the orange or banana which contain 12 grams for each medium sized fruit, respectively. However, it bears remembering that the fruit of the kiwi are smaller than that of the banana and orange. So this can add up. Kiwis are considered to have a low to medium glycemic index GI. This will depend on where you’re sourcing your kiwi fruit. They range from somewhere around 47 to 58 in the GI scale. More importantly, they’re considered to be low in glycemic load at around 4 to 7. Again depending on where you source your fruit. However, keep in mind that this load is based only on one fruit. So that quickly adds up when you eat more than one per sitting. Overall, kiwis are good for you. They’re healthy and packed with nutrition. The only possible drawback with kiwis, as with other fruits, is that the do have some sugar in them. This means that while it’s okay to eat them regularly, you shouldn’t consume a ton of them at a time. 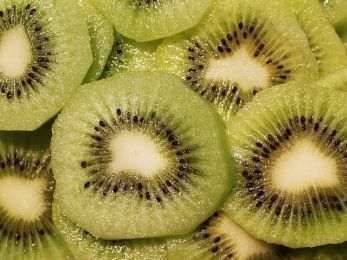 As long as you don’t overeat, which you probably will never be able to, kiwis are a healthy addition to anyone’s diet.